For many centuries, books and magazines have been published whose sole aim has been to educate children, to assist with their learning of basic subjects and expand their knowledge of areas they are unlikely to experience. As early as the 11th century, young monks were taught a Latin text called Ælfric’s Colloquy to help them learn the language; ‘Courtesy Books’ began appearing in the 15th century, mostly concerned with teaching young gentlemen manners fit for high table; an innovation of the 17th century was to add illustrations to help learning. The first educational periodical appeared in London in 1751 when John Newbury began publishing Lilliputian Magazine. Although short-lived, it was the first of hundreds of magazines that have appeared over the past 250 years aimed at children. Most of the early titles were notable only for their earnest desire to inform and instruct and their uniform dullness. 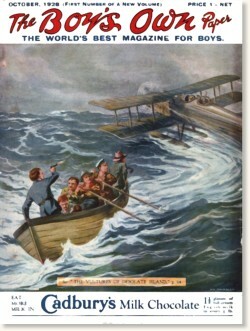 The most famous children’s weekly of the 19th century was the Boy’s Own Paper, published by the Religious Tract Society as an alternative to cheap papers known as ‘penny dreadfuls’ which had titles like Boys of England and Young Briton and contained stories of pirates, historical battles and made the school story a staple of children’s magazines. BOP (as it was popularly known) was equally patriotic but its fiction was less ‘fierce’ and surrounded by features on sports, schools and how to make everything from kayaks to wireless sets. BOP, and its companion, Girl’s Own Paper, also featured moral talks by religious leaders and medical advice from Dr. Gordon Stables which invariably involved getting more fresh air or hopping into a cold bath. Stories and articles full of sugar-coated moralising may have been attractive to parents but they failed to excite youngsters. ‘Penny dreadfuls’ continued to flourish until the 1890s when they were killed off by what A A Milne called the ‘halfpenny dreadfuller’. A young journalist by the name of Alfred Harmsworth had made some money as the publisher of Answers to Correspondents, a miscellany of information and serial stories by popular authors, and in 1890, began expanding his publishing empire with a halfpenny humour magazine filled with jokes and cartoons entitled Comic Cuts. It was soon outselling Answers and became the cornerstone of Harmsworth’s success as well as inspiring dozens of rival comics. In 1893-94 he launched three magazines for boys in quick succession, Halfpenny Marvel, Union Jack and Pluck, which, at half the price of other boys’ magazines, soon carved themselves a large slice of the market. Alfred Harmsworth (later to become Lord Northcliffe) and his brother Harold (later Viscount Rothermere) brought together their various publishing enterprises under one roof and named their company Amalgamated Press, eventually to become the largest publisher of children’s weeklies in the world. In 1904, Alfred Harmsworth employed a young journalist named Arthur Mee who had made quite an impact when he arrived in Fleet Street eight years earlier thanks to his enthusiasm and ability to turn his hand to any subject. Harmsworth had been publishing the successful Harmsworth Encyclopaedia in fortnightly parts and was looking for an editor for the follow-up, the Harmsworth Self-Educator. Mee threw himself into the work with zeal and the Self-Educator ran to 48 fortnightly issues from October 1905. The complete series was gathered together in eight volumes running to over 7,000 pages covering every subject from art, music and literature to history, geography and the natural world, all heavily illustrated with photographs and line drawings. After co-editing the Harmsworth History of the World (1907-09), Mee began work on what he was to call “the book of my heart.” It was the Children’s Encyclopaedia. Arthur Mee was inspired to put together The Children’s Encyclopaedia by his young daughter’s incessant questions. It was to be a vast compendium of knowledge and became one of the publisher's most successful publications. Originally issued in 50 fortnightly parts between March 1908 and February 1910, it was at first a slow seller. However, as the weeks passed, sales began to soar and the early issues were reprinted to keep up with demand. As the initial run came to an end, Amalgamated Press re-launched the title as the monthly New Children’s Encyclopaedia, later changed to Children’s Encyclopaedia Magazine and then to Children’s Magazine before becoming My Magazine in 1914. This new version of the Children’s Encyclopedia (the diphthong having been dropped) went through 14 editions until 1945 in which year John Hammerton, Arthur Mee’s biographer, estimated that 52 million volumes had been sold. A revised American edition was published as The Book of Knowledge in 1911-12 and translations appeared in France, Italy, Spain and China. When the title was re-launched in 1910, a new feature was soon added. 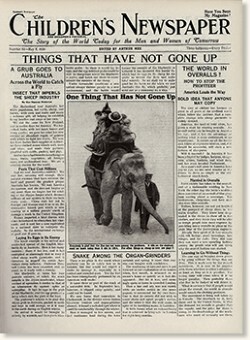 ‘The Little Paper’ was a supplement of news stories of interest to children which ran until June 1919 when it was incorporated into a new project from Arthur Mee, The Children’s Newspaper. This newspaper for youngsters was launched on 22 March 1919, priced 1½d. and deliberately laid out like a popular adult newspaper but with the addition of a photograph on the cover (many newspapers still ran adverts and notices). Subtitled “The Story of the World Today for the Men and Women of Tomorrow,” the paper epitomised Mee’s values and was steeped in the editor’s twin faiths: Christian ethics and the British Empire. Mee firmly believed that children could be guided to better, more creative lives through education. Where his Encyclopaedia had given the nation’s children a firm grasp of many subjects - historical, geographical and practical - his Children’s Newspaper was to keep young people up to date with the latest in world news and science. The paper had a wide-ranging group of contributors, almost all anonymous and given designations such as “our weather correspondent” or “our zoological correspondent”. Amongst the most prolific contributors were Harold Begbie, a former magazine editor, who penned many of the paper’s lead articles in the 1920s, and George F Morrell, the paper’s “astronomical correspondent” who supplied an item about Venus in the first issue and continued to write until shortly before his death in 1962. There is no doubt that Mee felt that The Children’s Newspaper reflected life’s changes over the years although his own florid writing style did not and his patriotism and faith never faltered. Science and technology moved rapidly on in the 1920s and 1930s, but an issue of The Children’s Newspaper from 1940 was almost identical to one from 1920. Mee’s successor, who took over on the founding editor’s death in 1943, was Hugo Tyerman who had worked with Mee as a picture editor on both The Children’s Encyclopaedia and My Magazine. It was only in the 1950s that the paper began to modernise. When Sydney Warner took over as editor in 1953, he gradually introduced new features, including film and television reviews, expanded the coverage of sports and sporting personalities and ran a series of popular text serials, including eight novels featuring Anthony Buckeridge’s Jennings and Darbishire. More new features were introduced in the 1960s by John Davies: Jonquil Antony began writing a column for girls in 1962, Patrick Moore started an astronomy column in 1963, and a ‘Pop Spot’ added photographs of the Beatles, Adam Faith and many others from 1964. At its peak, The Children’s Newspaper sold over 500,000 copies a week, but sales had fallen away in the 1950s when the paper was faced with an influx of new rivals, notably Eagle, Junior Mirror and Junior Express. In January 1962, Fleetway Publications (as the Amalgamated Press was by then called) had also launched a publication that was also to rival The Children's Newspaper. In May 1965, after 2,397 issues, The Children’s Newspaper was merged with the newcomer, Look and Learn.